We provide complete service, repair, and renovation plumbing in Charlotte for residential and light commercial sites in the greater Charlotte, North Carolina area. Aside from the benefits of using tankless water heaters, such as an endless supply of hot water, compared to traditional storage water tanks, there are many applications for Instantaneous or Demand Water Heaters. It is a well-known fact that tankless water heaters for Charlotte residents will save you money on electrical bills because you will not be spending on standby energy losses produced by traditional storage water tanks. Tankless water heaters are economical to use in remote BBQ or outdoor sinks. You can even install one in your pool house or pool shower where hot water is not always needed but is used only occasionally. If you have an outdoor bathroom, it is more advisable to install a tankless water heater because you will not be using it anyway. The same is true with remote hot tubs. Tankless water heaters are more practical to serve a booster and eliminate long pipe runs for solar water heating systems, dishwashers and sanitation. It is also interesting to note that you can save between 24% and 34% energy if your family is using only 41 gallons or less hot water daily using a tankless water heater compared to conventional tank water heaters. But for large families which consume at least 86 gallons of water per day, tankless water heater can be more energy efficient between 8% and 14%. To get maximum energy efficiency between 27% and 50%, you need to install a tankless water heater in every hot water outlets in your home. When buying gas-fired tankless water heater, you have to identify if you are using natural gas or propane. This is important as you need to know if your gas line can support your gas-fired tankless water heater Charlotte customers need. 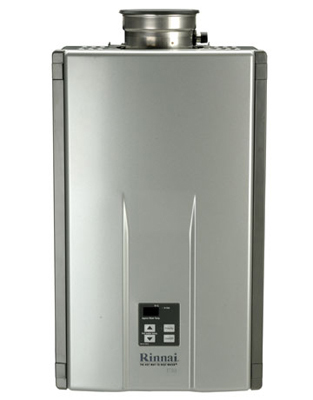 A tankless water heater, also known as demand water heaters will give you and your family hot water only when you need it or as demanded. This system of water heaters do not produce any standby energy losses as conventional storage water heaters, so you save a lot of money on your energy consumption. 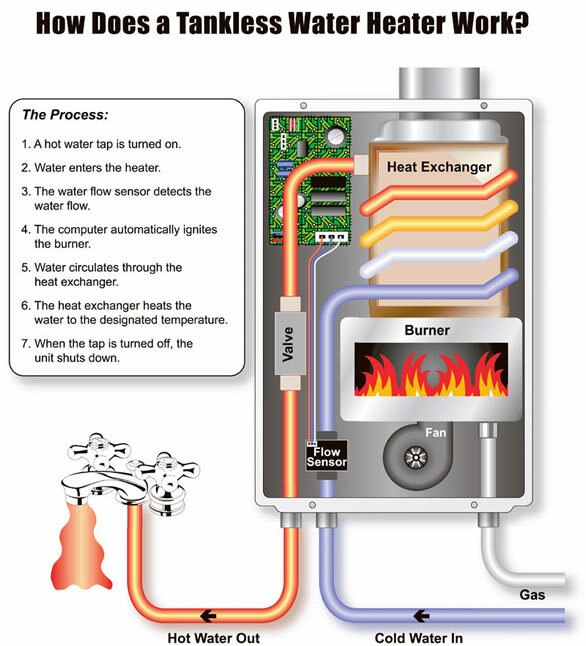 Here is some basic information on how a tankless water heater for Charlotte consumers works. This is very important knowledge, whether you are using tankless water heaters at home or in the office. Because it is a demand water heater, a tankless water heater for Charlotte consumers do not use any storage tank. Instead, it heats the water directly as it passes through it. This system enables it to avoid any standby heat losses as when you are using storage water heaters. The water is heated the moment you turned the tap on and cold water passes through a pipe then into the unit. But the best benefit tankless water heaters for Charlotte consumers can provide is its energy efficiency. Whether you use an electric-powered or gas-fired tankless water heater, you can be sure to reduce your energy costs on water heater by as much as 50%. There is a lot of good reasons why you should pick a tankless water heater than a conventional storage water tank heater. One of them is you save a lot on energy consumption. Using a tankless water heater may save you over $50 per month on your electric bill. Conventional storage water tank loses its heat up the pipe and then reheats, even when you are not using hot water when you are away at school or sleeping at night. This is called the standby heat loss. So it is more practical to use tankless water heaters for Charlotte consumers because it does not produce standby energy loss. The global economic downturn and the rising cost of energy prices are wake up calls for us to rethink our energy consumption, even how we use hot water. These tankless water heaters will save you more money considering its 20 years life expectancy even if you take into account the cost of purchasing a unit. Because it is energy efficient, you are also contributing to global climate change campaign. Besides, tankless water heater will need lesser space in your homes and it is easier to maintain as well as more convenient to operate. You can usually get a return on your investment for a unit of tankless water heater between 3 and 7 years depending on the model that you bought and the amount of hot water you use, as well as the cost of energy in your locality. The smaller the amount of hot water that you use, the faster the payoff. The seldom you use your water heater, especially if you are living alone, you will have a lower energy bill consumption because tankless water heater do not produce standby heat loss. The normal life expectancy of a tankless water heater is about 20 years. Although there are some who were able to use their tankless water heater for a longer period of time because tankless water heaters can be serviced and repaired. If you use it properly, your tankless water heater will provide you with your daily hot water requirements provided that you install it properly and maintained as well. It is therefore recommendable that you instead install tankless water heaters. "Award-winning plumbing is our business, customer service is our specialty!" Copyright © All About the Pipes Plumbing, Inc. 2019. All rights reserved.